Is éard is Ionghabháil Texas ann ná corprú Phoblacht Texas i Stáit Aontaithe Mheiriceá sa bhliain 1845, agus glacadh isteach í mar an 28ú stáit ar 29 Nollaig, 1845. D'fhógair Poblacht Texas a neamhspleáchas ó Phoblacht Mheicsiceo ar an 2 Márta, 1836. Ag an am sin bhí an chuid is mó de dhaonra Texas ar son ionghabháil na Poblachta ag na Stáit Aontaithe. Bhí ceannaireacht an dá phairtí polaitíochta mór , an páirtí Daonlathach agus na Fuigeanna, ina gcoinne, mar gur mheas siad go raibh a lán daorsheilbhe ann sa réigiún, rud a chuirfeadh isteach ar aeráid so-ghalaithe pholaitiúil na linne sin, agus conspóidí sa Chomhdháil faoi ar son - agus frith-sclábhaíocht ag dul ar aghaidh . Ina theannta sin, ba mhian leo cogadh le Meicsiceo a sheachaint, rialtas a dhiúltaigh aitheantas a thabhairt do fhlaitheas a cúige ceannairceach sa tuaisceart. Agus eacnamaíoch an Chúige ag laghdú sna luath 1840í, d'eagraigh Uachtarán Phoblacht Texas, Sam Houston, cainteanna le Meicsiceo chun iniúchadh a dhéanamh ar an bhféidearthacht aitheantas oifigiúil a fháil maidir le neamhspleáchas a bhaint amach, le Rialtas na Breataine Móire ag déanamh idirghabháil eatarthu. ↑ Malone, 1960, p. 545: ". 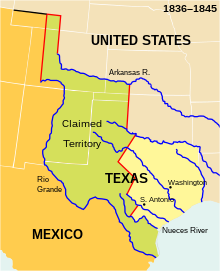 ↑ Wilentz, 2008, p. 558: "... the heightening of sectional tensions in Congress made it imperative that [the Whigs] find some compromise ground in the 1844 election ... the same intersectional logic held true for the Democrats ..." and p. 560: 'Texas annexation had long been a taboo subject for Whigs and Democrats alike." ↑ Freehling, 1991, p. 355: "Immediately before annexation, both major parties remained frozen in their decade-long position that Texas was not worth a foreign war or sectional combat." ↑ Freehling, 1991, p. 369: "Sam Houston ... the Texas president apparently swerved from seeking an apparently unattainable annexation [to the US]" and "would negotiate independence from Mexico. ↑ Wilentz, 2009, p. 566: "President Sam Houston truly was interested in the British option [to negotiate a peace with Mexico] and was pursuing it vigorously and openly." Tugadh an leathanach seo cothrom le dáta an 28 Eanáir 2017 ag 19:59.